Aurora News: Slaves rescued in Jita! Most people know the busy tradelanes of Jita, the system that sells everything you need, and even more things you don't, legal and illegal! However, a bustling tradehub not only attracts traders; industrialists, speculators & customers alike, but also scoundrels, thugs & pirates! The danger of Jita became very real when I travelled through it this weekend. Near the Perimeter gate, I noticed a group of Tornado's & Catalysts at the gates... These are known ganker ships, used to destroy transports and loot their wreckage for valuable cargo. 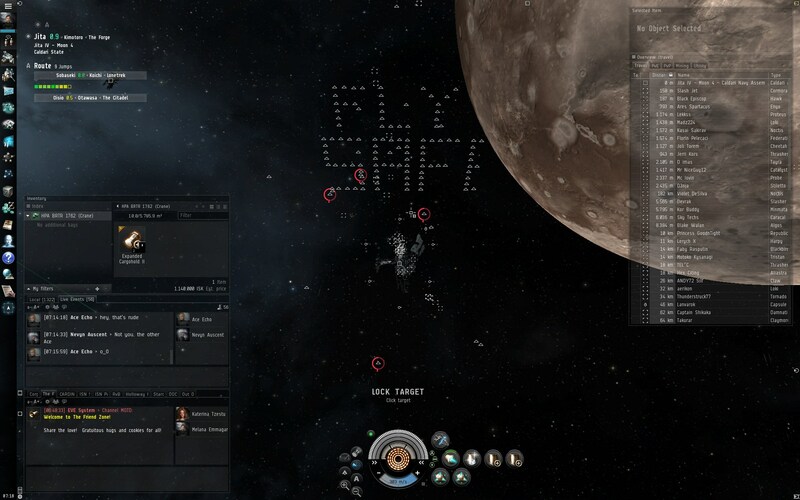 As I cleared the Perimeter gate for a last jump to the Jita 4-4 Navy station, the Catalysts found a target! A mammoth industrial making its way to the gate, but it would never reach it... The Catalysts opened fire, ripping apart the defenseless ship. Scanners informed me something was left behind in the wreckage. To investigate safely, I activated the cloak & inspected the wreckage. Turns out this trader wasn't so innocent after all! Almost a thousand slaves were left behind in the unbreached bulkheads of the destroyed transport! Immediately a rescue operation was set up, speed was critical, as the Tornado's and Catalysts were still out there, and a blockade runner is a soft target. As my ship decloaked and linked with the wreckage, transfer of the slaves began right away. As one of the Tornados began targeting me, transfer was complete, and I jumped towards one of the quiet Jita stations, to minimize risks for the crew and rescued slaves. After a short inspection, it became clear that these slaves were bought from Jita's black market and were in fairly bad health. After this assessment, I set course for the Arcology station, so our refugee center could give them the appropriate medical care and a temporary housing. Meanwhile, I contacted the Disciples of Ston concerning these slaves, as they have a long history and great expertise in helping out slaves. They agreed to pick them up and assist these poor souls in their well-known matriculation centers, to cope with what they had to endure as slaves. In total 960 Elite Slaves have been rescued from the slaver transport and are now under the care of the Disciples of Ston!